R: Responsible (Perform): This is the resource that Performs activity. There may be several R.
A: Accountable (Authority): Has the authority to approve the work A. There is only one A. C: Consulted (Accessed): Is consulted by R. Communication between R and C is bidirectional. There may be several C.
I: Informed: Is only informed of the work of R. There may be several I. 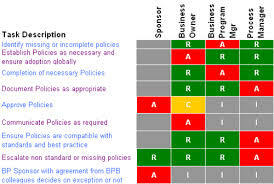 The RACI matrix shows activities and roles as in the example below. In each cell of the table, indicate the role of responsibility for the activity using the letters of RACI. For sustainability, it is advisable to use according to generic labels to describe the roles rather than people’s names. The RACI can be used to establish responsibility for a project but also a business. In a document template, it can also indicate who has to write (R) or validate (C) any part. There is only one person who validates the whole document (A). In all cases, the RACI is the ideal tool to clarify “who does what”.